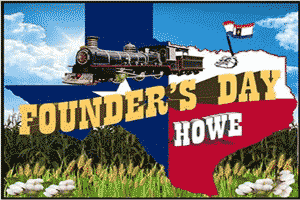 The Howe Area Chamber of Commerce will host the 33rd Annual Howe Founders Day Festival on May 4, 2019, from 2pm - 8pm. This year's musical feature will be announced soon. The festival contains vendors, food, entertainment, shopping, dancing, wine-tasting, lawnmower race, turtle race, limbo, and all things festival! Vendor registration is only $10.